One of my goals for Meet the Marbler is to not only spotlight professional marblers but also to feature students who have gone on to become avid marblers themselves. 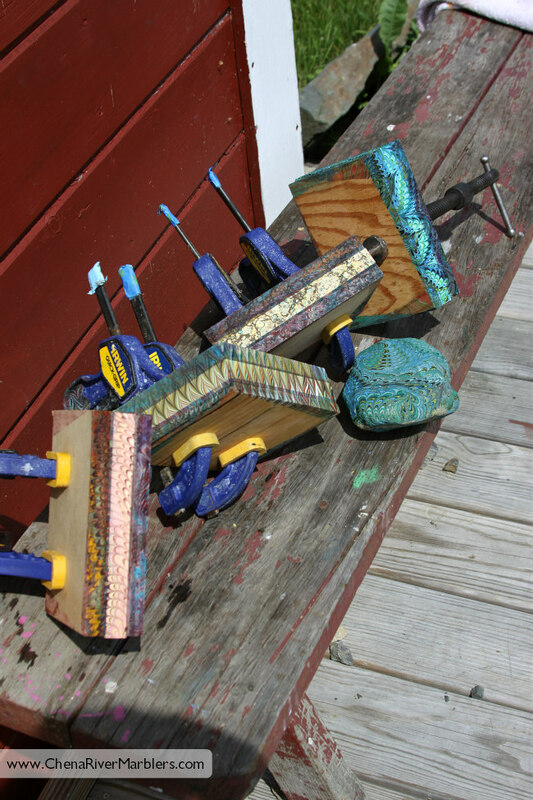 They, like me, were bitten hard by the marbling bug and could not resist the call to go deeper into their marbling practice, often incorporating marbling into their existing creative adventures. To watch my students flourish at the tank beyond the walls of the classroom is nothing short of pure joy to my marbling heart. I’m really excited that my first “student” feature is Erin Pieronek (though she is well beyond that classification now!). When Erin is in the room, you’d have to try really hard not to be affected by her enthusiasm and infectious smile. As a teacher, having her in class is such a gift because she approaches learning with zest, deep curiosity, and enthusiasm. She sees marbling as a constantly moving target that isn’t meant to be conquered but rather something to surrender to…a brilliant strategy any serious marbler will tell you is absolutely necessary for one’s sanity. 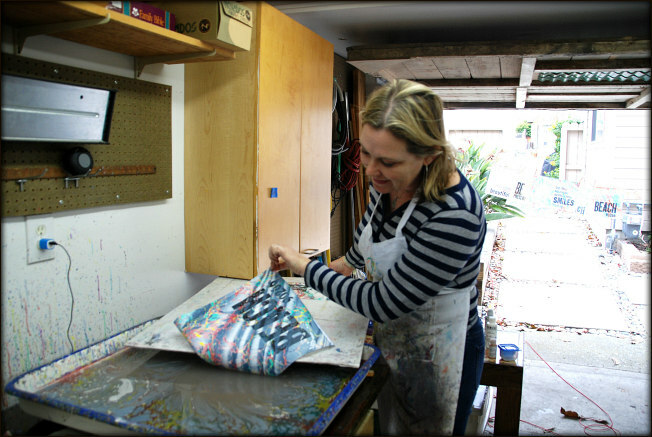 She is currently mashing up her letterpress skills with marbling and wowing me with her work. 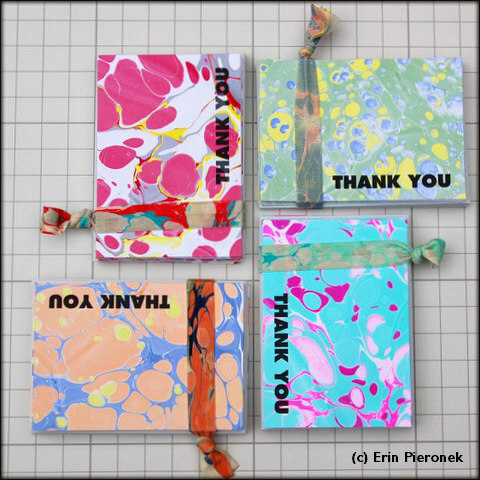 I’m always intrigued by people’s marbling journey and Erin’s is no exception. 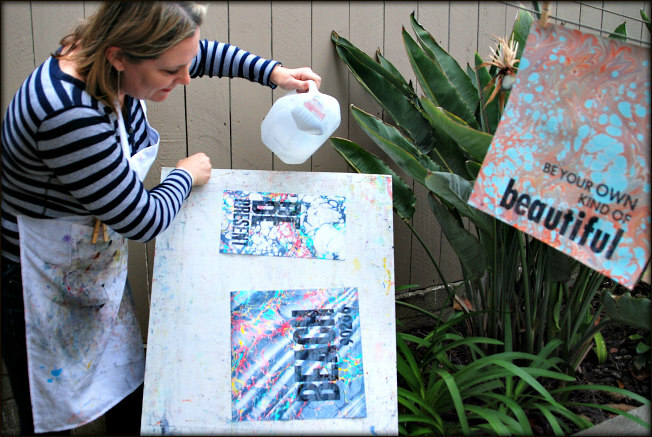 Settle in and enjoy her marbling story. 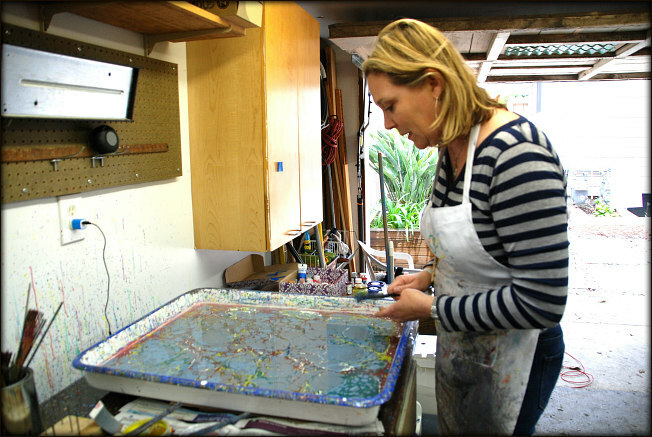 You have taken an in-studio class with me as well as private lessons and have rounded out your learning with one of my marbling eCourses. 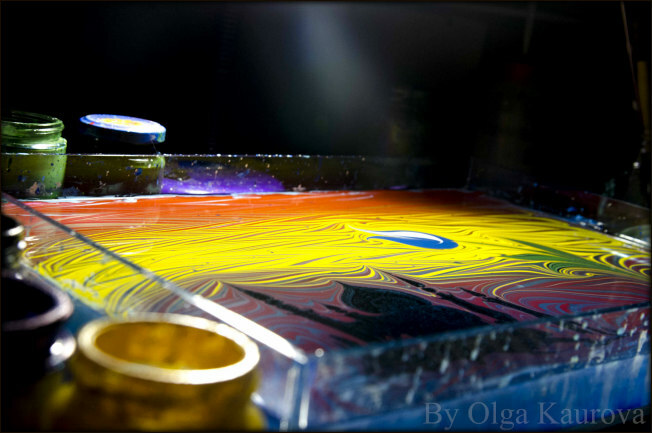 What attracted you to the art of marbling and why were you compelled to learn how to do it? I have always been fascinated by marbling. I once bought a copy of a Martha Stewart magazine that I held onto for years. It gave step-by-step how to do it but it seemed so over whelming I never tried. A teacher and friend had recommended I look into classes at BookArtsLA. One Saturday night, I looked it up. Your class was listed for that weekend. I followed the linked to Clouds on Water and watched your video several times. I couldn’t get enough! I had to finally try marbling. Sadly, that class was the very weekend I was looking at the website. I’d missed it! So I emailed you and waited until the next class you had. I haven’t looked back since. I would describe my style as experimental. It is rewarding to have a classic pattern turn out but I usually want to alter or disrupt it. Some of my favorite pieces are from what I thought was a mistake so I went one step further in experimenting with nothing to lose. Most of my work now is combining letterpress with marbling. I print a number of different words or phrases so I have options to work with. Once I create my pattern on the bath, I select the phrase I believe best suits it. Other times I add the letterpress after I marble. Each one is different with its own personality. You said when I took my first class with you not to worry if I didn’t like a piece today; look at it again tomorrow and you will find something amazing about it you missed the first time. You’ve been right many times. 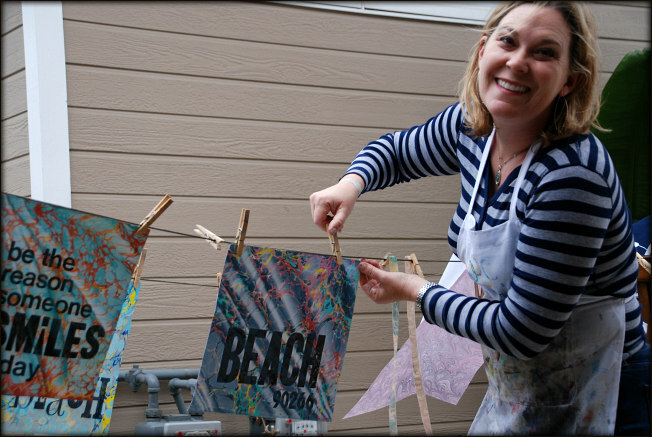 Prior to learning how to marble, you already were a talented letterpress artist and graphic designer. 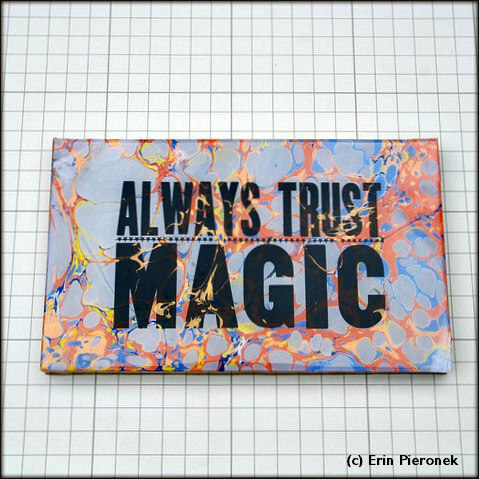 How have you incorporated marbling into your existing creative practice? I wouldn’t say I was a talented letterpress artist first but I was a designer. I had taken a class but the two art forms have really evolved side by side. I’ve always been a creative person and my choice of medium has changed a number of times. I laughingly say I am a serial monogamous artist. My BA is actually in Theatre Art though I always dabbled in applied arts even then. Starting in 2000, I did a lot of mosaics for a number of years. I also enjoyed scrapbooking during the same period. 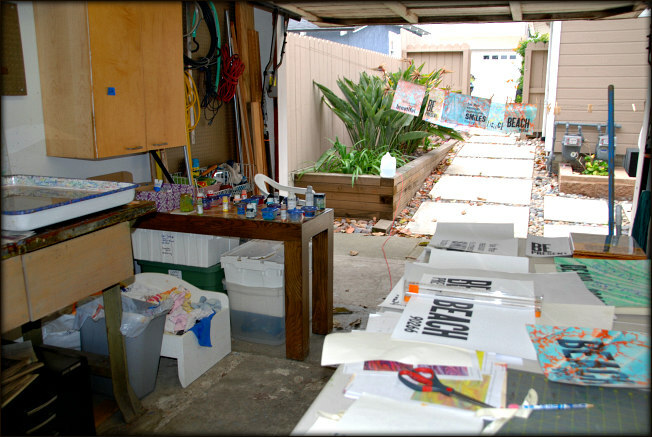 I taught scrapbooking, card making, and stamping for Paper Source. It was during that time that I fell in love with the art of letterpress but it was still a while before I actually learned how to do it myself. I’m not sure that all these creative practices interact with each other but each is certainly an expression of my obsession with color. Colors make me happy. I use to do needle point (and cross stitch and knit) and the best part, outside of finishing, was gathering the pretty threads to start the project. All those beautiful threads saturated with color. I think there is power in color to create beauty and joy. The best complement someone can give me of my art is it makes them happy, inspires them, or makes them smile. 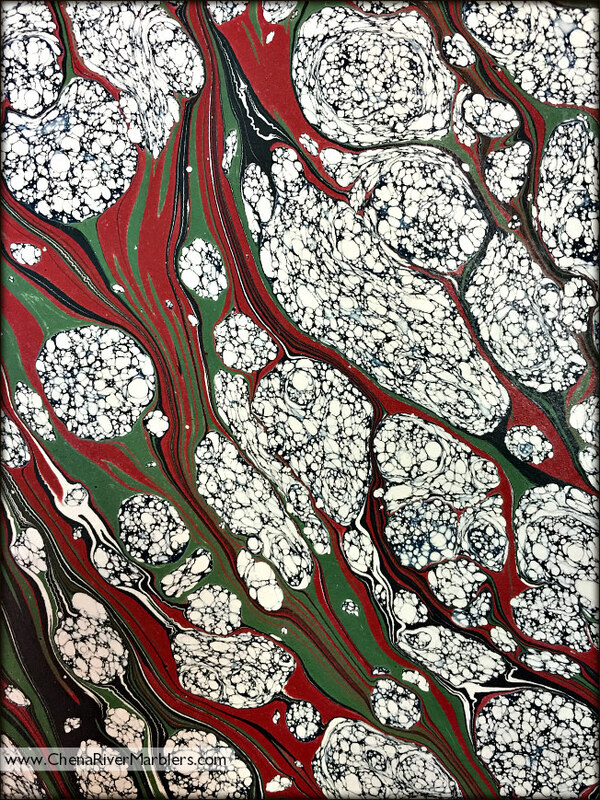 In marbling, it seems like every color goes together which allows for greater freedom. In letterpress, I work with either polymer plates, which are very clean and exact, or wood type, many of which are 100 years old. The wood type may have been used at different shops maybe all over the nation. It’s the sentimental side of me but the same wood type I use could have announced important events. Many are dinged up from dropping them, poor storage, or misuse. Again each has character, so often I pick the ones with the dings. Funny enough, I print most in black and navy because when I marble of top of them the metallic paints shimmer and I smile. After going back to school and learning the digital skills I wanted for Graphic Design, I suppose it’s not surprising that I am back creating most of my work by hand. 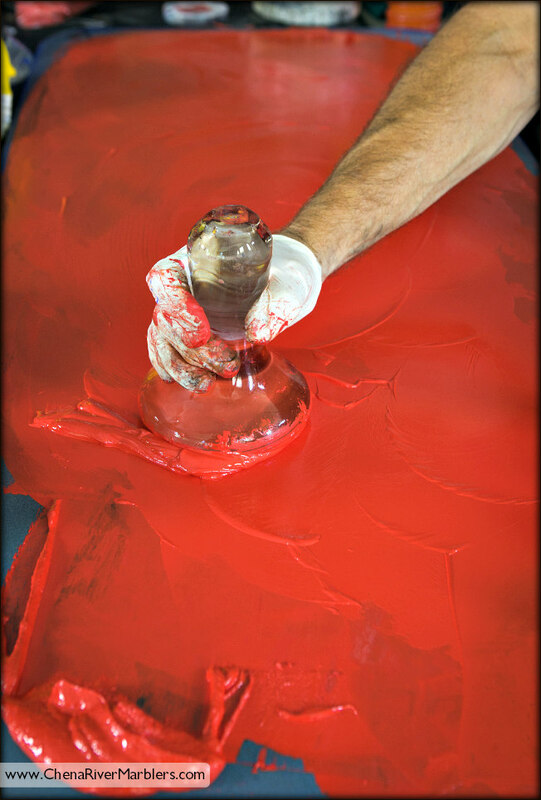 Do you have any rituals, habits, or practices that you do before you step into the studio to marble? 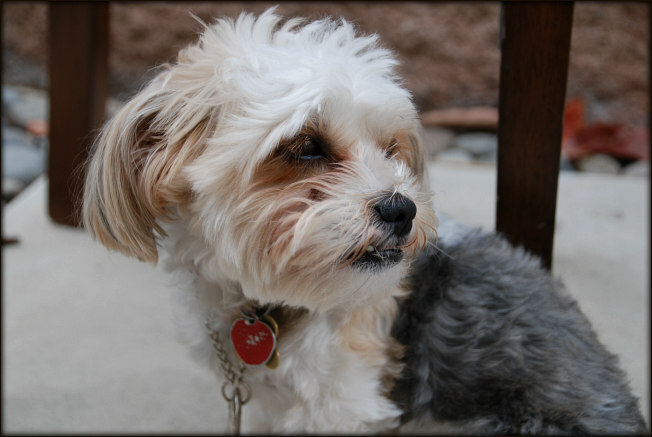 My studio is a couple miles from my home now so I always bring my dog, Pi. She often sleeps at my feet in a box with clean rags. She is very quiet but keeps me company. Every once in a while I don’t bring her and I miss her. 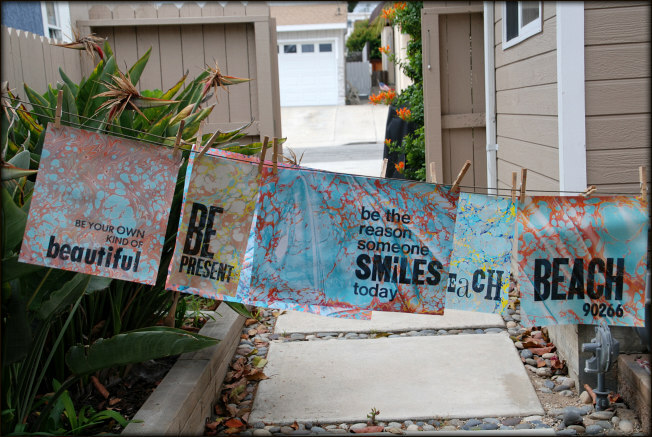 I love putting on my apron…it’s like a sign to begin. I sometimes listen to music but mostly I listen to podcasts. Voltaire’s old saying is true, “Don’t let perfect be the enemy of good.” I can’t be a perfectionist when I marble because there are too many variables: the weather, that color that won’t seem to really push today, or when something goes wrong with the piece that seemed just right. Each time is an opportunity for me to start over or re-imagine my plan. My own expectations are my biggest stumbling block. When I can’t seem to create exactly what I want, I shake it off by just getting out some plain paper. I play and reconnect to the mystery. 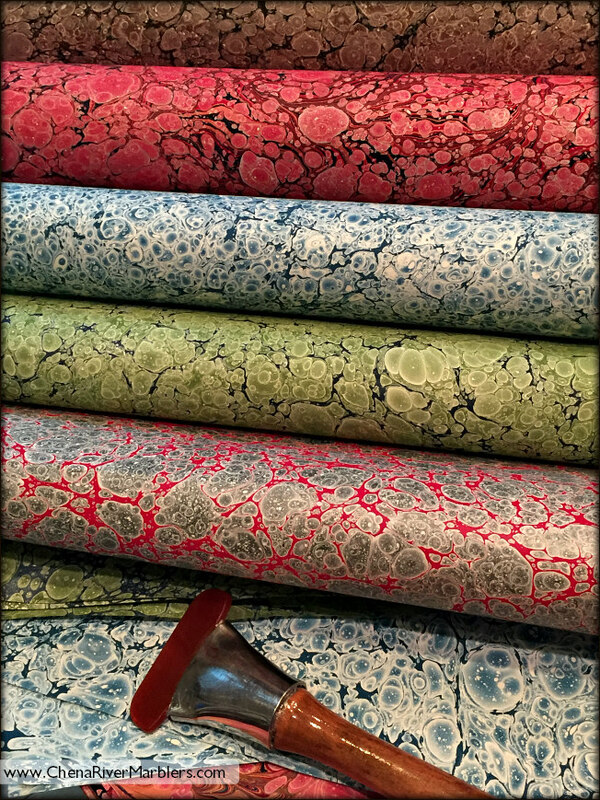 You have taught marbling to friends and family, including your children. 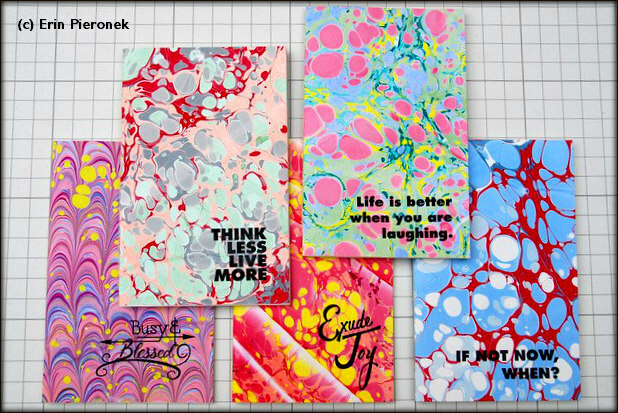 What does it feel like to share the magic of marbling with them? 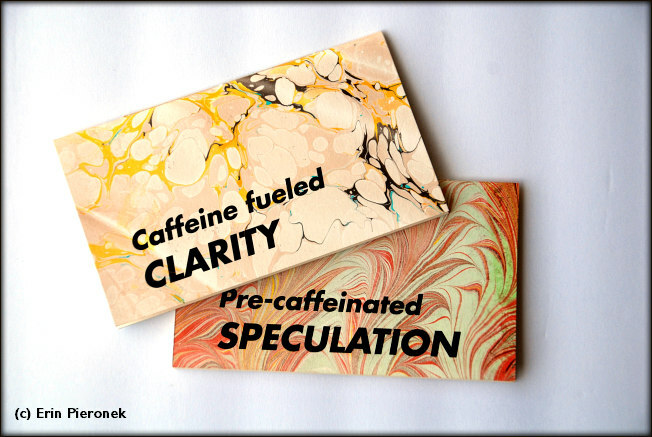 How has it changed the way you marble or think about marbling? I love to see the excitement as people pull their first paper off the bath. 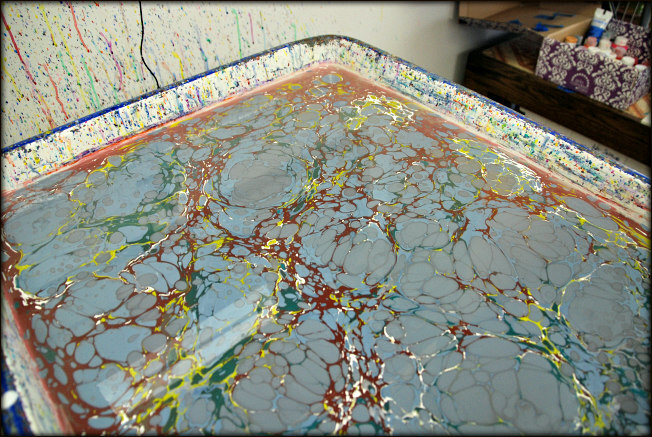 Marbling is always magical, but the excitement of someone new to the art form brings me joy. Now that I have been marbling for a nearly three and a half years, when I teach someone, I realize how much I’ve grown. I also know I still have a lot to learn and more I have to discover both at the tank and about myself as an artist. Both my kids are carefree and fearless and their work is beautiful. I’m trying to embrace that fearlessness more in life and at the tank. Don’t plan too much and enjoy the magic. 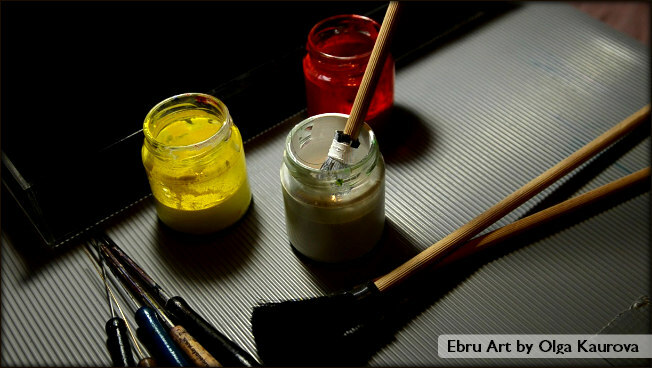 Are you working on any new projects, marbling or otherwise? I have been working on new cards that have a clean and simple letterpress greeting on the front and the inside is marbled. 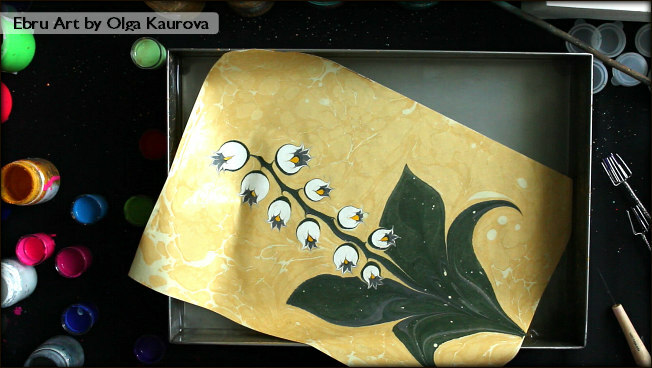 They are surprising and mysterious just like marbling. The funny part is some people are afraid to write on them. I am working on wallpaper for my powder room. I am equal parts excited and nervous about it as I alter my artwork digitally to be printed. It will be a hybrid project as an outside company will be printing it for me. I’m new to selling my art work. 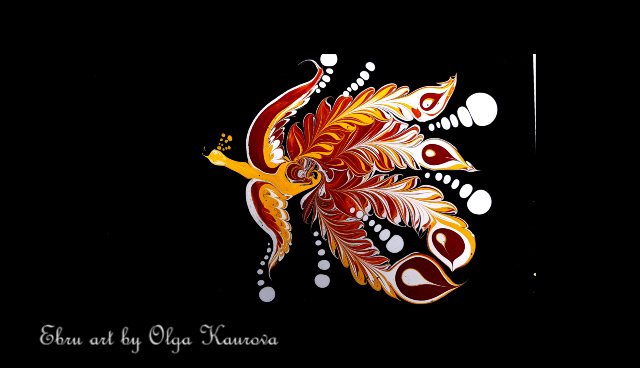 In the past, I always created for myself and gifts. It is both exciting and scary as I explore this new world. 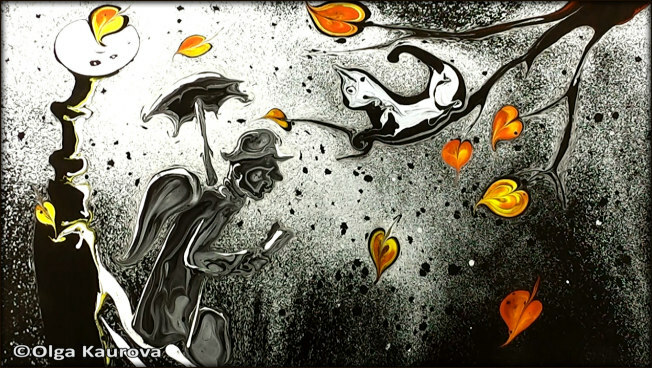 I have been in sales for a number of companies but selling my own art makes me feel more exposed than I ever imagined. I’m Erin, a Los Angeles native and creator. I love to make beautiful things and I believe the glass is always half full. A few years ago I went back to school for Graphic Design. I had been designing for years but always had to ask for help when it came to anything digital. I wanted to learn to create what I saw in my mind’s eye, so I did. I still use some of those digital skills but coming full circle I am back creating mostly by hand. I had always been mesmerized by marbling but it seemed like a lot of steps, and it is. 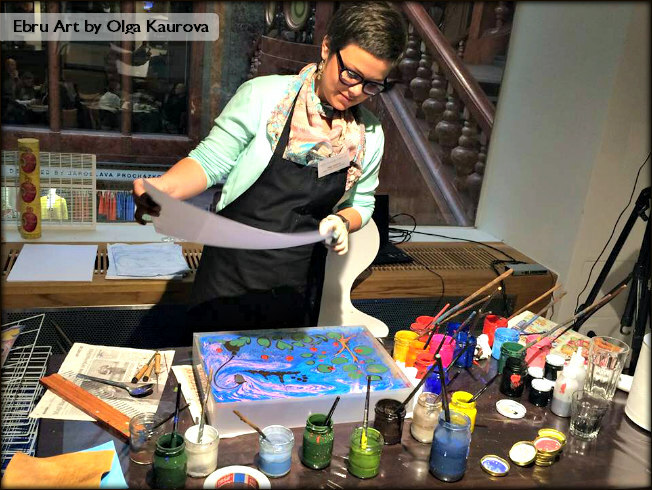 In 2015, I happened upon a video of a local marbling artist and teacher and never looked back. I’ve been making the world more colorful ever since. I actually combined my letterpress with my marbling by sheer luck. I had run out of paper and went digging through my stash looking for more and I found some of my old letterpress projects so I prepped them for marbling. I love the community of the lab press studio at Otis where I print and find constant inspiration. This is happily balanced with my quiet studio work where I prep, marble, and mount my pieces with the company of my dog Pi. For me the magic and beauty of each medium enhances the other. No piece is perfect. There are too many variables, but there is a freedom in imperfection or maybe they are each perfect just the way they are. Meet the Marbler Series Launches Sept. 4th! 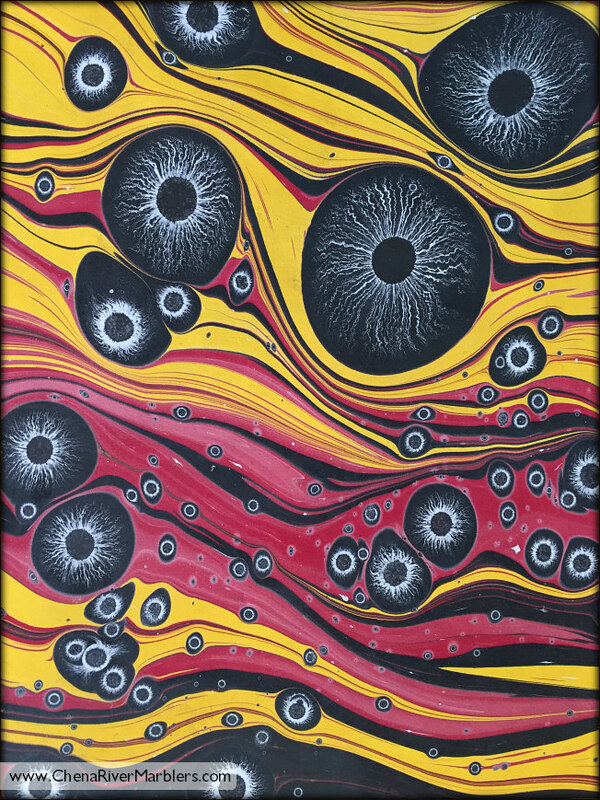 As many of you have heard me say before, my mission is “to bring marbling to the masses.” I love this art form so much and want everyone to experience the wonder and awe of its beauty, magic, and intricacies. And behind every marbled piece, there is an artist that is just as magical and intricate and beautiful. As I dive deeper and deeper into the world of marbling, I am continuously exposed to so many of the art form’s wonderful contributors. And, wowaz, are these contributors diverse and vast—geographically, stylistically, generationally, creatively, and technically. 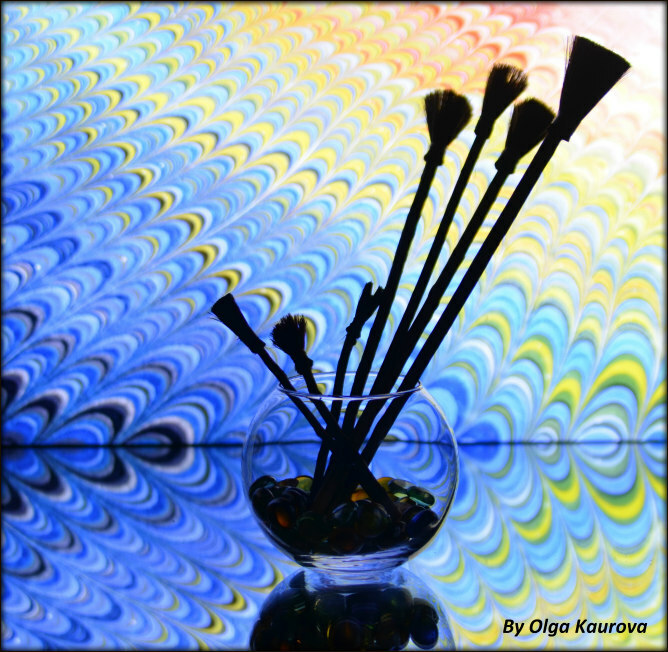 If I had all the time and money in the world, I would visit every single artist in his or her studio and experience marbling through their eyes and actions. I always tell my students that every marbler does things differently and so much can be gained, even for professional marblers, by working with, or even simply observing, another marbler in action. But alas, we can’t visit every marbler so I’ve decided to bring them to us. 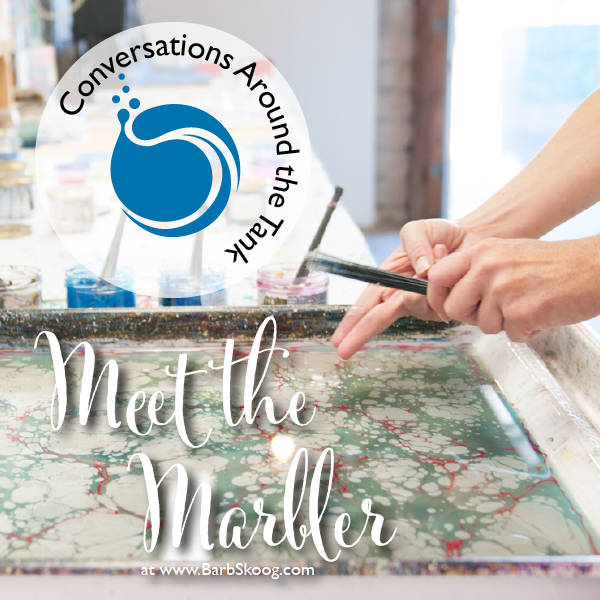 I’m starting a series called Meet the Marbler where I’ll interview marbling artists—ones I’ve met, ones I’ve taken lessons from, ones I admire from a distance, and even students who have gone on to integrate marbling into their existing creative practices. From the tiny pockets of the world we live in, this is a series dedicated to bringing us together by sharing marbling stories, talking about the ups and downs and pleasant surprises at the tank, getting a peek inside marbling studios, and shining a spotlight on the gems—large and small—that make up this remarkable art form. And I could not be happier to kick off this series with a stellar interview with Dan and Regina St. John of Chena Rivers Marblers. Stay tuned for the publication of their delightful, insightful story on my blog on Tuesday, September 4. I have a lovely line up of interviews ready to share every month or so, but I would love to hear from you who you would like to see featured in Meet the Marbler. Send me your suggestions, along with two or three questions you are dying to ask them, to Cheers@BarbSkoog.com.